The SaniDry Crawlspace Dehumidifier or SaniDry CSB is a large capacity unit exactly tailored to the conditions found in the typical crawlspace. It has a water extraction rate of 90 pints per day and is rated by the supplier as suitable for a crawlspace of up to 2200 sq ft. The CSB would be equally effective in a basement where its compact dimensions could be an advantage, depending on the layout of the space. The SaniDry Crawlspace Dehumidifier is companion to the SaniDry Basement Dehumidifier in the two model SaniDry range. The Brand is exclusive to Basement Systems who undertake a variety of basement finishing and improvement work and is manufactured by Therma-Stor who market their own branded range of Santa Fe basement and crawlspace dehumidifiers. The SaniDry crawlspace model is visually indistinguishable from the Santa Fe Advance and so similar in its published specifications that it seems highly likely that it is, in fact, the same unit without modofication If that is the case this dehumidifier cannot be faulted for its performance or its quality and a choice between the two could only be made on the basis of cost. Price information for the SaniDry CSB is not generally available and may only be obtained by a prospective purchaser on application to one of Basement Systems licensed contractors. The SaniDry price will include installation costs and this needs to be taken into account when comparing one offering with another. This unit is free standing and needs only to be attached to a power outlet and a drainage hose led to a suitable drain or other outlet where the water can be discharged. Installation should neither be involved or expensive and is well within the capability of any reasonably fit person who is strong enough, or has help, to manoeuvre this 71lb unit into place in the cramped confines of a crawlspace. The SaniDry Crawlspace Dehumidifier is Energy Star® rated and with an efficiency rating of 2.6 litres per kilowatt hour is far more energy efficient than a typical room dehumidifier. Therma-Stor design and engineering has produced a tough, durable unit to commercial rather than residential standards that can cope with the harsh conditions in a crawlspace and do it with excellent efficiency. The SaniDry CSB is compact and shaped long and low to fit comfortably into the tightest crawl space. Even with levelling feet added it is below 2 feet in height and although on the heavy side this should only be a slight inconvenience while positioning the unit as it is unlikely that it would have to be moved frequently thereafter. The unit should not need more than an occasional visit for routine cleaning and maintenance as it benefits from continuous drainage. The normal method of discharge is by means of a gravity feed to a nearby drain but the dehumidifier may have a separate condensate pump attached to raise the water to the next level of the house if no suitable outlet exists in the crawlspace. The low temperature operating capability of the SaniDry Crawlspace Dehumidifier is enabled by an auto-defrost system. The formation of ice on the refrigeration coils would normally prevent effective operation in cooler temperatures but with this device the CSB is effective down to 45°F. This dehumidifier is fitted with an adjustable humidistat. This is an energy saving measure which prevents the dehumidifier running once a safe level of relative humidity (RH) has been achieved. It may take a day or two for the CSB to lower humidity to the required level but once it is there it will simply cycle on and off as required to keep the level where it should be. A level of 45 to 50% relative humidity will be sufficient to inhibit mold growth and deter dust mites. If this dehumidifier is intended for use in a basement divided into several enclosed areas the SaniDry crawlspace dehumidifier can be attached to ducting to ensure efficient dehumidification of all these areas. An essential feature in a crawlspace dehumidifier is auto-restart to ensure the unit resumes operation at its previous setting following a power outage and, of course, the CSB includes this feature. As with the SaniDry Basement Dehumidifier there are few dehumidifier reviews of this product written by consumers. Satisfaction with the identical Santa Fe Advance is high however and its effectiveness, energy efficiency and durability are highly rated. 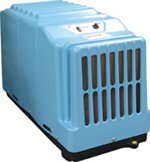 We are happy to recommend this dehumidifier as far as performance, reliability and economy of operation are concerned. The Therma-Stor Advance is one of the best crawl space dehumidifiers on the market and that comment must apply equally when it wears a SaniDry badge. We cannot comment on value for money since the SaniDry CSB does not have a published list price and this calculation must be made for an installation which may well be part of a larger basement reconstruction or renovation being undertaken by Basement Systems. We would be interested to hear the comments of Basement Systems customers who have had this dehumidifier installed by a Basement Systems franchisee and would be happy to publish them here.